ARS' associates share common values in the use of technology to improve society, preserve the environment, and increase the security and safety of our community." Aerospace Research Systems (ARS) is dedcated to creating the technological infrastructures necessary to for the sustained development of commercial, independent orbital space. Our primary goal is to engineer and build autonomous intelligent systems as the foundation to accessing and operating in space. Our emphasis on the development of evolutionary technologies, technologies that can be sustained while providing the greatest degree of innovation and cost effectiveness for a variety of applications and missions has created a successful foundation for the design of complex vehicle systems. Our multidisciplinary environment provides unique opportunities for leveraging technologies across disciplines and is the foundation from which we create innovative systems, develop new methods of inquiry and solve problems from a variety of scientific and technical field. The “ARS Business Model” is alien. Not extraterrestrial, but still alien to any business major. When ARSI was founded in September of 1993 many of us were still at college and the idea that we could build space systems sustainability in a considered, effective and competent way by earning money to fund our work was a little strange to many even then. But twenty years later we have done just that through consulting and building and spinning-off technologies and companies. We have built many of the infrastructures and technology base for commercial space exploration. Technology is only relevant when it is applied to real world solutions. ARS' R&D has been spun-off in five successful corporations and two collaborative projects. ARS' talent for developing revolutionary technologies has garnered patents, awards and funding across disciplines and applications. Our continuing dedication to scientific excellence and dedicated R&D will further our mission developing sustainable technology for Earth and space. Aerospace Research Systems is celebrating twenty-five years successfully creating technological infrastructures necessary for the development of sustainable private and commercial space. Our primary goal has been to engineer and build autonomous intelligent systems as the foundation to accessing and operating in space. Our on-going commitment to developing infrastructures for sustainable space operations and continued investment in R&D ensures engineering of robust space systems to further human space exploration. It is this corporate culture that provides ARS with unique knowledge and skill sets not found in most small companies. - Intelligent systems: neural technology, a new class functional structures, optronic neurons, automation, adaptive & self-organizing systems. Above: The Ramstar Orbital Spaceplane was derived from a hypersonic UAV designed to operate from aircraft carriers. 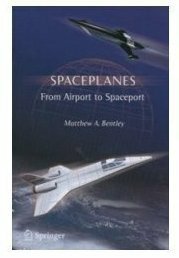 The Ramstar was featured in the Springer monograph, Spaceplanes: From Airport to Spaceport, by Matthew Bentley.